IT’S A GLOOMY DAY in Romblon. Cheryl and I quicken our pace as large clouds begin to gather in the sky. Up to now, the sky has been gray but calm, though it’s quickly changing. The rain first lightly taps on the roofs of the houses and then becomes a steady pitter-patter as the clouds spit out their beads of water. That my friend Cheryl and I find ourselves here in Romblon Town in the middle of the rainy season looking for a hotel – any hotel – sounds like a strange, if not an outright bad, idea. It was I who conceived of this plan. I just quit my job and am about to start a new one, while Cheryl is dealing with a broken heart. We felt we needed time away from the world to figure it all out before life intercedes and the sense of adventure is dashed by routine. Anyone who has been following this blog for a while will be well aware that there isn’t much I love more than a good kayaking opportunity! Whether it be in tannin filled rivers along the coast of South Africa or amongst enormous icebergs in Greenland, I feel at home in a kayak and will jump at any and every chance to explore different parts of the world from within one. 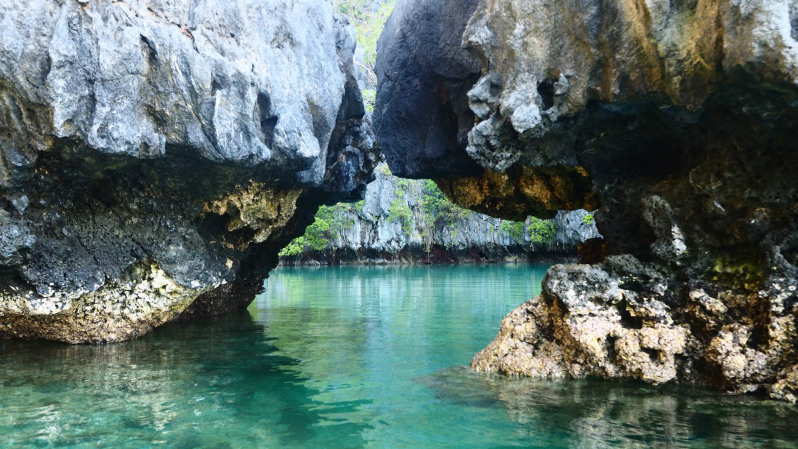 There are many different areas to explore in the El Nido archipelago, but arguably the most famous and most popular are the big and small lagoons. These naturally formed lagoons are renowned for crystal clear waters, abundant wildlife and amazing snorkelling opportunities.